I first read this book when I was at school, some 60 or so years ago. I found it in the school library, and thought it was OK. My main memory of that reading was that it was there that I first learnt about the Augrabies Falls on the Orange River. 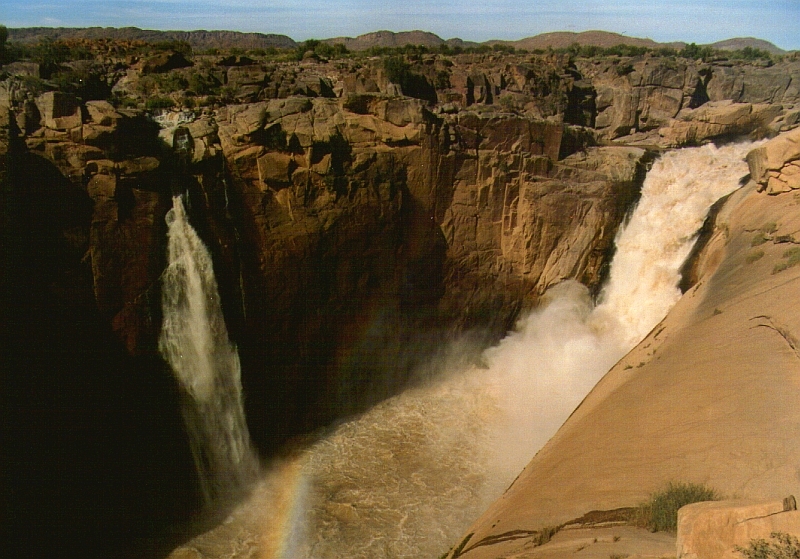 I had never heard of the Augrabies Falls before, which, according to the book, were higher and had a greater volume of water than the Victoria Falls and the Niagara Falls, which weveryone in the school knew about. But no one else at the school had heard of the Aughrabies Falls either. I thought that one day I would like to visit the Aughrabies Falls, and about 25 years ago I did. They were impressive. I still haven’t visited the Victoria Falls or the Niagara Falls, and probably never will, but with the possibility that we may pay a second visit to the Aughrabies Falls later this year, I took this book out of the City of Tshwane municipal library and read it again. The second reading was very different from the first. The first reader was a schoolboy who had never been to any of the places described, and could only imagine what they were like. I had to picture it like the land of Mordor in a work of fiction (which I only read abouot 10 years later, in 1966). On the second reading I had visited several of the places described in the book, and so the second reading was a reminder of places I have known. The second reading was also after we had embarked on the study of family history, and Lawrence G. Green mentions relatives of mine or my wife’s in this and several others of his books. His anecdotes are not always accurate, but they are nevertheless informative and entertaining. How does one characterise Lawrence G. Green‘s books? He is a journalist, travel writer, amateur historian, gossip and raconteur. He has a journalist’s nose for the news, and so in his travels he makes notes of stories, not just current news, but old news, news of years ago, stories that are, as he puts it in the title of one of his books, Almost forgotten never told. I come to this book now with a more critical eye. Not only have I researched the family history (and so know that some of the details of his stories about our relatives are inaccurate), but I’ve also studied general history and historiography, and so am on my guard for evidence of racism or colonialist propaganda, which are evident in many books written by white people about history and travel in southern Africa in the first half o0f the 20th century. There is some, but less than I expected. 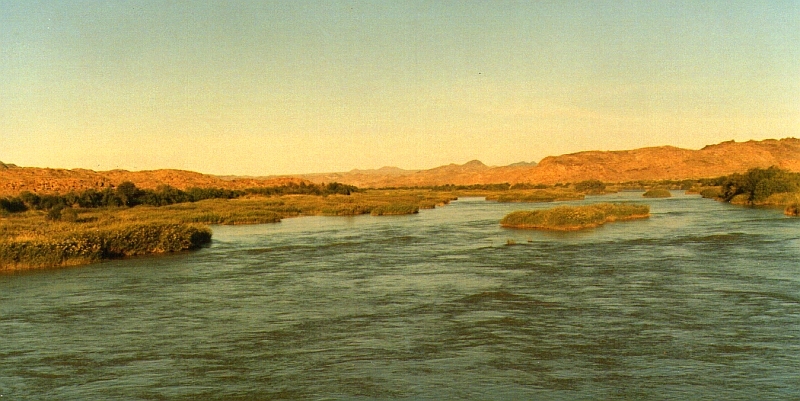 In describing the wars of the German colonial rulers of Namibia with the Bondelswarts tribe, he notes several instances of the Bondelswarts chivalrous behaviour, trying to avoid civilian casualties, leaving a note of apology on the body of a military medical officer they had shot by mistake, as they had not noticed his medical badgges until it was too late, and saying they would not shoot unarmed doctors. The Germans, representatives of Western “civilization”, on the other hand, were carrying out wars of extermination in that period (1904-1908). Green begins his story a bit away from the river, at Union’s End, the remote boundary marker where the borders of Botswana, Namibia and South Africa meet, now part of the Transfrontier Kalahari Park. I haven’t been to Union’s End, but I have travelled through the Kalahari Gemsbook National Park from Twee Rivieren to Mata Mata, up the dry and dusty valley of the Auob River, on my first visit to Namibia in 1969. I did not know, having forgotten from the first reading, that there was a settlement of Basters there, different from those of Rehoboth, who once had a shortlived Republic of Mier. Of course there is the description of the Aughrabies Falls, though when Green visited in the 1930s he had to swim streams to get to where he could see the falls, whereas when we went there in 1991 there were bridges. He describes the history of Onseepkans, where we crossed into Namibia in 1991, a year after it became independent, when the border officials were still housed in prefabs and tents. I took the name to indicate that some travellers who had crossed the hot and dry plains of Bushmanland, south of the river (which Green also describes) had taken the opportunity to wash their hair in the river, and washed the soap out too. But apparently the name is derived from a Hottentot word, meaning the drinking place for cattle. Green tells some of the history of the mission station at Pella, which we have not visited, but may visit later this year, where Roman Catholic missionaries, with no knowledge of building at all, constructed a large cathedral. Green also describes Goodhouse, where a relative, Abraham Morris, seems to have worked at one time, probably in the early 1920s. Green gives more information about Abraham Morris in another book, So few are free, and you can read more about the Morris family here. 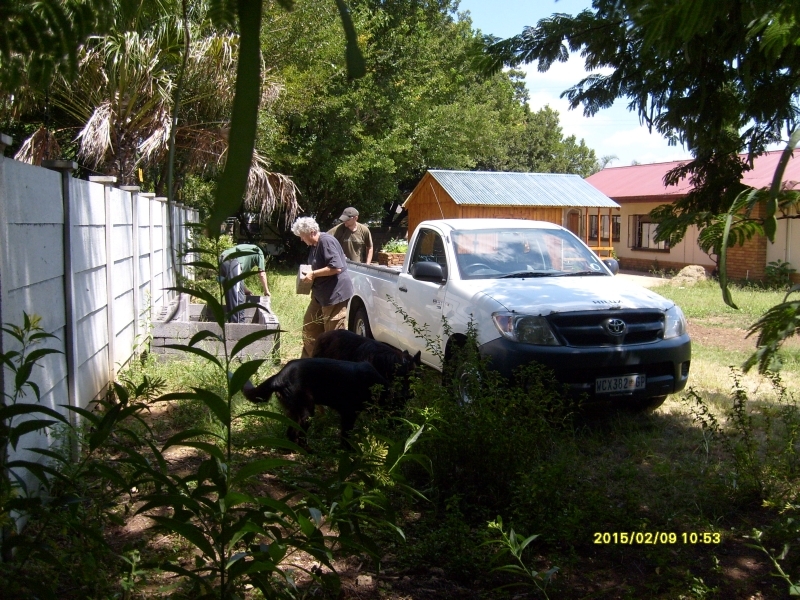 If we travel this way again in August, we hope to see more of the places where these families passed on their overland journeys between Damaraland and Cape Town, and also to do some more research on them in the Cape Archives. So the second read was much more interesting than the first, partly because I have been to some of the places mention in the book, and we hope to see some of those he mentions that we have never seen before. So I recommend this book to anyone who has travelled in the Northern Cape or southern Namibia, or who is planning to. Others might find it interesting too, as I did when I read it the first time. With the success of our first raised vegetable garden, we started a second one yesterday. 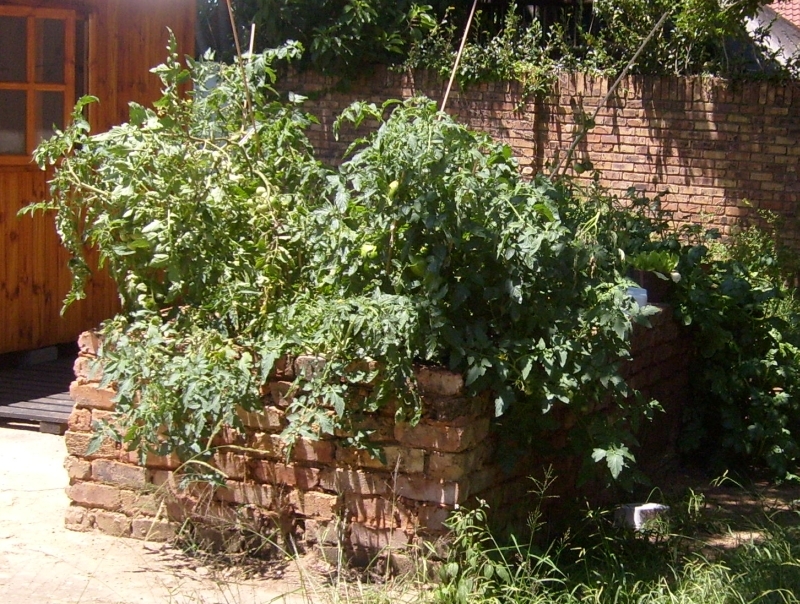 The first one took a long time to build, using bricks we had salvaged from our ruin. This time we had it up in half an hour, using cinder block bought for the purpose, with no cement. The raised garden keeps the dogs out, and also makes it easier to work on. 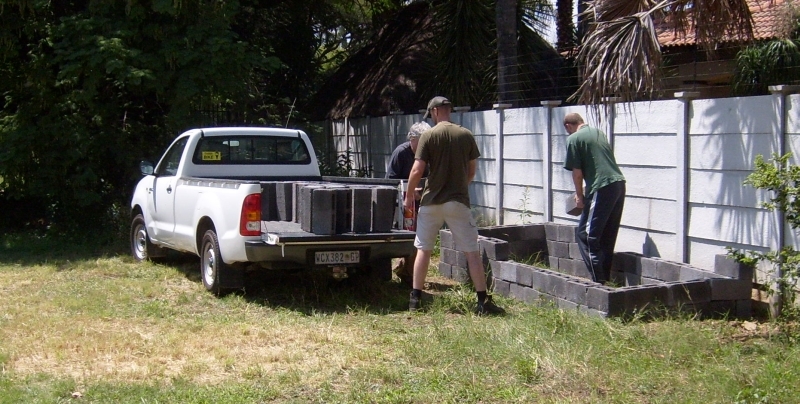 Jethro was on leave, so we used his bakkie to fetch the blocks, and many hands made quick work of putting them together. For some time we’ve been making use of parsley from our kitchen garden, and in the last week we’ve been having lettuce and tomato as well. 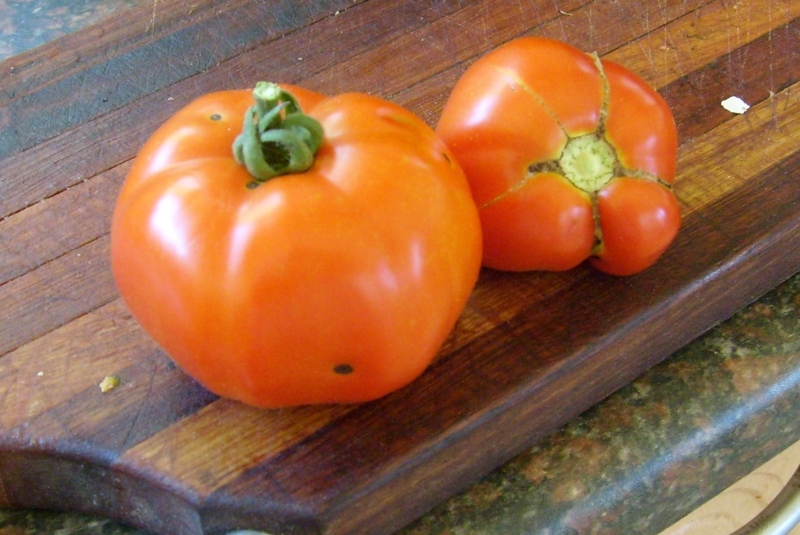 The garden seems to be getting a bit overcrowded, so we’re planning to build another raised bed to add to it. The tomato plants have grown big, and in the back on the right are the potatoes, which have spilled over and reached thr ground. We hope they have put as much energy into producing spuds as they seem to have put into producing stems and leaves!